To make its postpaid plans more enticing to mobile consumers, Smart Communications has beefed up the bundled products and services that go with each offer. This laudable move by the MVP-company gives subscribers even greater value for their money and allows them to build more meaningful connections and relationships. 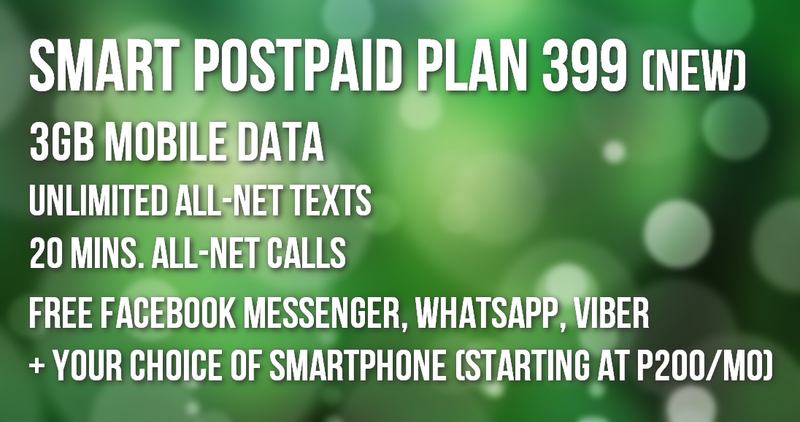 One of the plans that got a major boost is the budget-friendly Smart Postpaid Plan 399, which now gives subscribers 3GB of Volume Data for Open Access, Unlimited All-Net Texts, 20 Minutes of All-Net Calls, and Free 500MB Facebook Messenger, WhatsApp, and Viber access per month! Previously, this plan came with only 1GB of mobile data with no access to the mentioned messenger apps. With 3GB of Data, you can already watch up 6 full-length movies or listen to more than 80 music tracks! If you love watching gadget reviews and features on Youtube, this allocation should allow you to view up to 10 quick review clips. Starting this month - April 2017, Smart Postpaid Plan 599 and 799 will likewise get an additional 1GB of open access mobile data allocation bringing the total to 5GB and 8GB, respectively -- apart from the messenger app freebie. For Plans 999 and above, subscribers will get free access to an app of their choice per month. Some of the applications they can choose from include Facebook, Twitter, Waze, Spinnr, and Instagram. 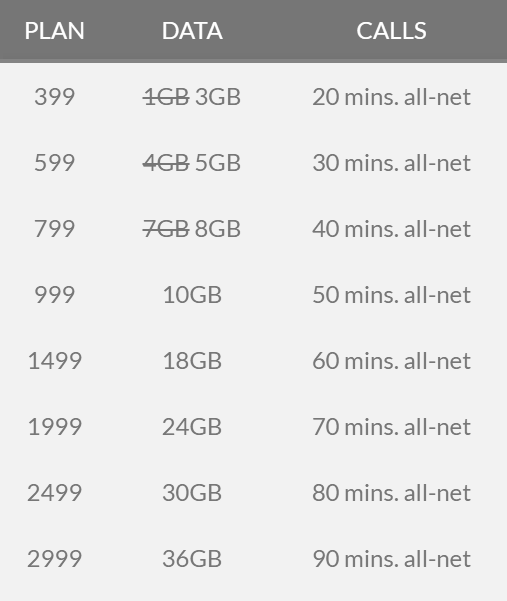 I personally find Smart Postpaid Plan 999 particularly enticing with 10GB of Data Allocation. As a Youtube Partner and Video Creator, this should be good enough for me to upload more than 20 smartphone and laptop reviews on the site per month! Talk about enjoying a reliable service to get my job done and to share my work with my supporters and subscribers. Interested? You just need one valid ID to sign up for a line-only Smart Postpaid Plan! It's really easy. Just visit a Smart Business Center near you for quick registration. Samsung Galaxy J7 Pro - Php 600/mo. for 30 mos. Samsung Galaxy J5 Prime - Php 400/mo. for 30 mos. Samsung Galaxy A7 - Php 800/mo. for 30 mos. Oppo F3 - Php 800/mo for 30 mos. Huawei Mate 9 - Php 800/mo for 30mos. LG K7 - Php 200/mo. for 30 mos. Samsung Galaxy J5 2016 - Php 400/mo. for 30 mos. LG Stylus 3 - Php 400/mo. for 30 mos. Apple iPhone 6 16GB - Php 400/mo. for 30 mos. Apple iPhone 6S 16GB - Php 1000/mo. for 30 mos. Apple iPhone 7 32GB - Php 1,500/mo. for 30 mos. Samsung Galaxy S7 Edge - Php 1,500/mo. for 30 mos. Apple iPhone 7 128GB - Php 2,000/mo. for 30 mos. Apple iPhone 7 Plus 32GB - Php 2,000/mo. for 30 mos. For those who love watching movies and TV series on their handsets, Smart offers cool entertainment app services that can be bundled with these plans. You can enjoy iWantTV, iflix, and FOX+ on your smartphones for only Php 120, Php 99, and Php 390 per month, respectively. If you love making calls and the bundled 'call minutes' in your Plan is just not enough for you, you can always sign up for All Net Talk 249 Flexibundle top up and enjoy an additional 80 minutes of calls to all networks! Now, here's the best thing in all of these: Smart Communications is currently gearing up to deliver even faster, more reliable and higher quality mobile services all over the country through aggressive LTE network rollout and constant improvements. In fact, subscribers in many parts of the country are now starting to feel the benefits of these enhancements via top-notch download and upload speeds. I personally got to experience it in its maximum during my visit to Davao last month, March 2017. And even here in Manila, Smart LTE speeds are now getting a major boost. Experience it for yourself by signing up for a Smart Postpaid Plan today! Is plan 349 upgrade to plan 399 possible?